Happy February, or rather, happy Black History Month! 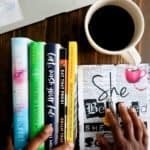 Every February, I share a list of books by black authors that I think we should all read. I’m continuing that tradition. Today I’m going to share 10 Must-Read Books by Black Authors this year. Notice I said this year. Usually, my lists are what I’m reading for the month. But some of these books are deep. Some of them are fiction and some are memoirs. That means they won’t be an easy quick 5-hour read. Some are older, some are new, some have not been published yet. But it’s something to keep in your journal and check off for the year. this is by no means a definitive list. But I feel like these 15 books will get you started this year. I’m sure there are more coming out that I forgot about or even books that I left off that you are like BUT HEY!! That’s probably another post at another time. I saw this one in Essence Magazine late last year. I ordered it this morning. I was mad when the first book ended and I realized there would be a sequel. Just left a sister hanging. Another classic. Just get it. This one has been on my to-read list since it was published. I love following him on Twitter and reading his words wherever he posts. Can’t wait to read this one. Confession, I have never read this one. I meant to, because it’s James Baldwin! It’s been on my to-read list since I saw it in Target last year. I plan on reading it for sure this year. I read this one in High School It was a Christmas gift from my unsuspecting mother. LOL. I still have my original copy that was passed around to all my female relatives. A Classic and still my favorite book of hers. The book that made me fall in love with Pearl Cleage. The next book due out NEXT WEEK by the author of The Hate U Give. I can’t wait. Also one that has been on my to-read list. Can’t wait to tackle it. Have you read any of these books? Are they on your to-do list? In the comments, tell me what books resonated with you? What book is the one that opened your eyes, made you laugh or cry, enlightened you, or just made you feel good? And if you have even more suggestions, SHARE!